amalian is a range of mono-phasic and bi-phasic hyaluronic acid based dermal fillers manufactured in Germany by S&V (Skin & Vision) Technologies and distributed in the UK by 4T Medical. The current product range includes 9 CE mark certified filler products to target indications for rejuvenation by the treatment of fine lines and wrinkles and deep folds to strong volume augmentation or lip augmentation. S & V Technologies have been manufacturing implantable medical products for the past 20 years and has entered the dermal filler market with a range of very high quality products based on a its new patented technology called Core-in-shell (CIS) which they claim ensures long term stability of the product in the skin, as well as an easy application through the needle or cannula due to the smoothness of the gel. The product range includes two distinct sub brands for the mono-phasic and bi-phasic lines, LT for the mono-phasic soft cross-linked hyaluronic acid and expert for the bi-phasic product using the CIS technology of highly cross-linked hyaluronic acid micro-particles inside a non-cross-linked hyaluronic acid shell. How is it made and what does it contain? The mono-phasic hyaluronic acid fillers (amalian LT smoothline, amalian I LT active, amalian II LT intense and amalian LT beauty lips) are homogenous gels of soft cross-linked hyaluronic acid. Each formulation of amalian LT has been individually customised for the indication of use and are generally suited for treating fine to moderate wrinkles and folds or for lip enhancement and augmentation. The concentration of hyaluronic acid and cross-linking density of each gel is tuned to target an optimal viscoelastic status for the individual product according to the manufacturer, as well as providing a very smooth injection flow. amalian balance is the non-cross linked product in the mono-phasic line. 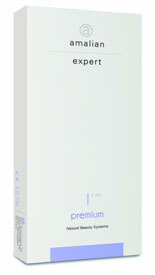 The amalian expert gel is a highly cross-linked hyaluronic acid which is formulated with their CIS technology. 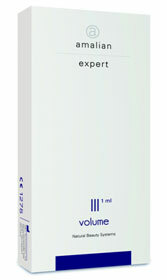 This unique CIS technology makes amalian different from other products made of cross-linked hyaluronic acid. The “Core-in-Shell” structure forms a stable core of highly cross-linked hyaluronic acid surrounded by long chains of non-cross-linked hyaluronic acid, which form a protective shell. This structure delays the degradation of hyaluronic acid by hyaluronidase (found naturally in the body which metabolises hyaluronic acid over time) and helps to prolong the effects of the treatment. Due to their specific properties, all amalian expert gels have to be injected in smaller volumes and deeper than traditional hyaluronic acid products. The CIS technology has a effect on what is known as the viscoelasticity of the gel. When no pressure is applied to it, the gel is viscous (thick) and thus able to augment where it is placed. When pressure is applied as it is injected into the skin it will liquify under the pressure which make the injection smooth and product delivery easy. Then, once injected, the hyaluronic acid gel will immediately “bounce back” into its original thick, viscous state to act as a filler within the dermal tissues. The amalian LT products can be used on top of the amalian expert products if additional correction and treatment is needed more superficially, so a combination treatment may be suggested. Temporary due to breakdown of hyaluronic acid in the body over time. Hyaluronic acid gel for improving skin hydration. It is specially developed for rejuvenation, bio revitalising and hydration of face, décolleté, neck and hands using a mesotherapy technique into the upper (superficial) dermis. It is recommended to repeat treatments three times at two-week intervals. Touch-up treatments should be performed every four to six months for long lasting skin rejuvenation. Soft cross-linked hyaluronic acid gel designed to smooth age related fine lines, vertical lip lines, crow’s feet, forehead lines, perioral lines (around the mouth), vermillion border of the lips and glabella. Tear troughs can also be lifted. The gel is injected in the upper to middle layer of skin. For tear troughs subcutaneous injections are placed outside the orbital area. This mono-phasic soft cross-linked hyaluronic acid gel is well suited to correcting fine to medium lines and soft wrinkles in the forehead, perioral and periorbital areas (around the eyes, crow’s feet etc. ), as well as for lip definition and lip enhancement and is injected into the upper to middle layer of the skin. This mono-phasic soft hyaluronic acid gel is designed to lift middle to deep wrinkles and folds. The formulation is most suited for lifting nasolabial folds, oral commissures and marionette lines, smoothing skin depressions (e.g. acne scars) and moderate reshaping of facial contours such as the chin or non-surgical nose reshaping, e.g. bridge augmentation, as well as stronger lip augmentation treatments. It is injected into the deep dermis, thus should not be used in the forehead or the glabella. 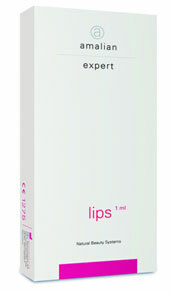 amalian LT beauty lips is a new mono-phasic soft gel designed to satisfy the needs of lips tissue. This extra smooth gel was formulated to enhance lips fullness and contours. For achieving beautiful and natural looking lips, the manufacturers recommend placing five tiny gel spots in the lips symmetrically, followed by gentle modelling after injection. This bi-phasic highly cross-linked hyaluronic acid gel is for filling fine to medium wrinkles and is injected into the middle layer of the skin (upper to mid dermis). Due to the CIS technology amalian I expert premium lasts up to 12 months, but has to be injectedto start with in lower doses and in deeper layers of the dermis, compared to the amalian I LT active product to achieve the long-lasting effect. This bi-phasic highly cross-linked hyaluronic acid gel (for use by experienced users) is suitable for medium to deep wrinkles and folds, for acne scars and the vermilion border of the lips. This gel has to be injected into the middle to deep dermis and claims to require less material than any other hyaluronic acid gels to achieve a long-lasting effect. Bi-phasic gel designed to restore age related facial volume loss (lipoatrophy) and contours. This formulation is used for cheek and chin augmentation, deep folds and scars and for re-contouring of the jawline, as well as so called ‘liquid lift’ face lifts. It is injected into the deep dermis and is used like the other ‘expert line’ products in smaller quantities. 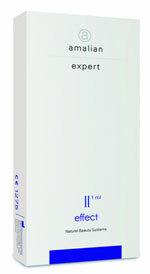 amalian lips expert is a highly cross-linked hyaluronic acid gel for a stronger lip augmentation. It should be applied very economically with a minimum of punctures and follow up treatment are advisable. Lip augmentation with this product may cause swelling which can last for 3 - 4 days. For a fine to medium lip augmentation it is recommended that amalian I LT active, amalian II LT intense or amalian LT beauty lips be used instead of amalian lips expert. As with the other expert amalian gels, amalian lips expert shows a very high effectiveness in terms of durability and long lastingness. Those with a known hypersensitivity to hyaluronic acid. During a current case of influenza (flu like symptoms within the last 14 days) as the risk of an immunological reaction is too high. Those with a propensity for herpes (cold sores) may be given additional medication before a lip augmentation treatment can be performed. There may be mild to moderate swelling and discomfort in the area injected shortly after treatment. For lip augmentation and depending on which product is used, this may last from 2 days up to a week. In some cases (depending on the product and area being treated), and to avoid unnecessary swelling an initial treatment may be carried out, followed by a touch-up treatment 14 days later. The cost of amalian treatment will depend on the product being used, the quantity used and area(s) or indication(s) treated, along with the individual practitioner or clinic. You could expect to pay £450+ for a tear trough treatment for example. Click for ALL amalian clinics in the UK & Ireland registered and verified by Consulting Room.